A Kansas man will spend the rest of his life behind bars for fatally shooting an engineer from India whom he called a "terrorist," prosecutors said, and for wounding two others. 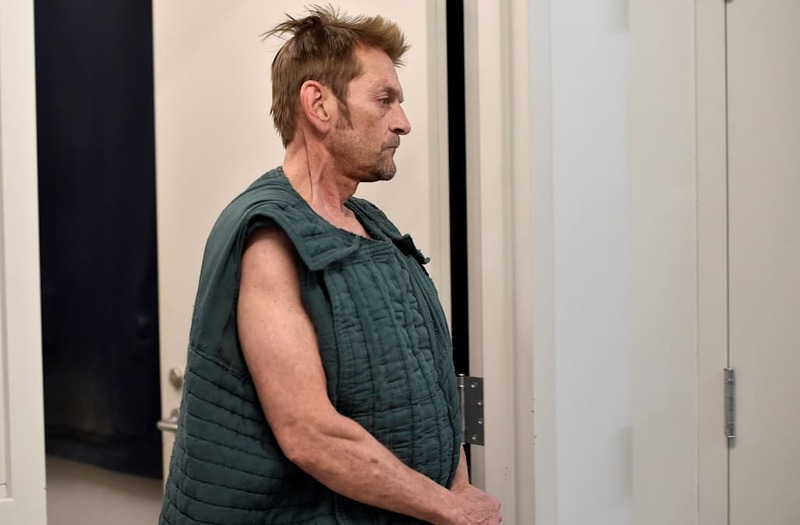 Adam Purinton, 53, was sentenced to three consecutive sentences of life in prison without the possibility of parole Tuesday morning after pleading guilty in May in Kansas federal court to a three-count indictment, which included hate crime and firearm charges. Prosecutors said Purinton shot and killed 32-year-old Srinivas Kuchibhotla and wounded his friend Alok Madasani, also from India, while they were at Austins Bar and Grill in Olathe, Kansas, last February. Purinton, who originally pleaded not-guilty to the federal indictment, admitted to poking Kuchibhotla in the chest, calling him a "terrorist" and an epithet against people of Middle Eastern descent, and shouting, "Get out of my country!" according to a statement from the Justice Department. Adam Wade Purinton, is shown in this Johnson County Jail booking photo in New Century, Kansas, U.S. on February 24, 2017. Courtesy Johnson County Sheriff's Department/Handout via REUTERS ATTENTION EDITORS - THIS IMAGE WAS PROVIDED BY A THIRD PARTY. EDITORIAL USE ONLY. He then drove home, got one of his guns, and returned to the bar to carry out the shooting, prosecutors said. "The crimes at issue in this case are detestable," Attorney General Jeff Sessions said in part in a statement Tuesday. "The defendant acted with clear premeditation in murdering one man, and attempting to murder a second man, simply because of their race, religion, and national origin. As a result, a promising young life has been tragically cut short, and other lives have been filled with suffering." Emails seeking comment sent to Purinton's federal defense attorneys were not immediately returned. A spokesperson for Sunayana Dumala, Kuchibhotla's wife, said Dumala would not be attending Tuesday's sentencing. In her victim-impact statement, Dumala described Kuchibhotla as kind, caring and always respectful of others. She also had a message for Purinton. "If you could have kept your anger inside and spoke to my husband softly, Srinu would have been more than happy to share his background and help you understand that not every brown skinned person is suspicious or evil, but kind, smart and contributing to America," Dumala said in part in her statement, according to the Justice Department. "Instead you chose to rage and bully in anger and when you were stopped, you decided to take their lives." Purinton's sentencing on the federal indictment, which comes a little more than three months after he was sentenced on separate state charges, wraps up a case that sent shock waves through the Indian community both in the U.S. and overseas. A few weeks before the Feb. 22, 2017, shooting, Purinton had been sitting alone in the bar area of Austins Bar and Grill when Kuchibhotla and Madasani just so happened to be having a drink on the patio, Purinton admitted in his plea agreement and testified in open court, according to the Justice Department. After spotting the pair, Purinton said to a regular sitting at the bar, "Did you see the terrorists on the patio?" prosecutors said. On the night of the shooting, Purinton sat again by himself, this time on the enclosed front patio, the Justice Department said. At a table to his right were Kuchibhotla and Madasani, to his left Grillot and several other patrons. Kuchibhotla worked as an aviation systems engineer and programs manager at GPS maker Garmin. "Purinton poked Kuchibhotla in the chest, called him a "terrorist" and an epithet disparaging persons of Middle Eastern descent, and shouted, "Get out of my country!" the Justice Department statement said. Hours after the shooting, Purinton told a friend over the phone, and later a bartender in person, that "he had just killed some Iranians," according to the Justice Department statement. Purinton admitted that he shot both Kuchibhotla and Madasani, attempting to kill both men, "because of their race, color, religion and national origin."